The Signal and SGA gear up for the debates. Day two of the Student Government Association (SGA) candidate debates began just before 8 p.m. on March 30. 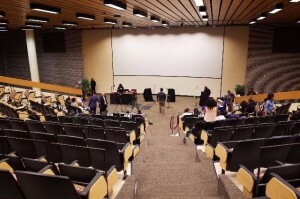 The Speaker of the Senate candidates Anescia Loi, Blessing Akomas and Janae Williams kicked off the debates, each speaking on topics such as campus safety, student involvement and sexual assault. When asked to complete the sentence, “Guns on campus are…,” both Williams and Akomas filled in the blank with “unnecessary.” Loi had a similar response saying weapons on campus are unwelcome and students deserve more protection, regardless. Williams said she conducted a campus safety survey of her own and found that 95 percent of students surveyed do not want guns allowed on campus. However, Williams said if campus carry is passed into law, additional steps should be taken to ensure safety. “There should be gun training sessions to show how to use the gun and how to respond to someone who is scared or asks about the gun,” Williams said. Akomas said students need to take safety into their own hands with the help of GSUPD and added programs. Candidates were also asked how SGA would deal with the very real threat of sexual assault being that the most dangerous place for a woman in the United States is a college campus. All candidates agreed that sexual assault education programs should be added on campus and in dorms. Loi said one of her main concerns was underprivileged and especially homeless students, as stated on her platform. She said she has personally reached out to help these students. “I’ve held clothing drives that go directly to Georgia State students through NAACP and the children’s hospital where I work,” Loi said. Williams and Akomas both focused in on transfer students whom they think deserve programs to help them transition into Georgia State. “Programs like FLC’s should be available to transfer students to make them feel like they have someone they can count on,” Williams said. Akomas, a transfer student herself, claimed that transfer students are more neglected than freshman and programs like Incept should be made available to them.